This image had me smiling this week when I saw it on Facebook. A few thoughts about the heavenly food. • Center cut bacon gives me the illusion of eating healthy. What do you like and/or dislike the most about bacon? When I was pregnant with my first child, I craved bacon and had it almost every day. We just started charging for extra bacon at the restaurant I work at (everyone asks for extra bacon). I agree that crispiness is the real issue. I tried turkey bacon once...bleh. My dd found this and showed it to me a couple of days ago. 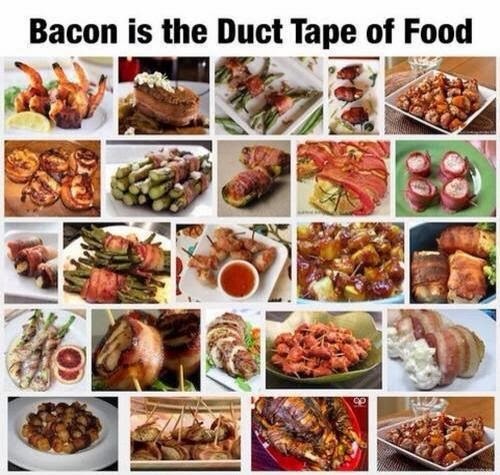 Bacon bits are the fairy dust of the food community! I love bacon, especially Blts. Bits really add something to salads Denise. Taste is the numero uno Fred! I love it crisp! Don't care for it wrapped around things either. Hard to beat crisp bacon Debby! Might be an art to making it? Crisp, and on BLTs or with my waffles. All else is faddish, follow-the-leader, and unnecessary. And too much of a good thing. Bacon MUST be crisp! Hubby is a wimpy bacon ester; yuck! I confess that while the pig is unquestionably the most edible animal, bacon is second to ham for me, but oh, ham and bacon on a pretzel bun is heavenly lunch!! Ham AND bacon Nani? Add cheese an it is a trifecta! !